All photos by Tom Dahlin/Getty Images. As an Augsburg student, Jon Dahlin ’05 needed to find an event that would enable him to contribute to his track team’s success. His track coach, Dennis Barker, suggested the hammer throw would be a good fit—much better for him than the other throwing events. And Coach Barker was right-on. But neither of them likely suspected that years later, Dahlin would compete in various highland games, both nationally and internationally—and would rank 7th in the 2015 International Highland Games. While at Augsburg, Dahlin not only set a hammer throw record; he shattered his own record by 14 feet in his senior year, achieving an NCAA Division III automatic qualifying standard in the men’s hammer throw. The new mark that he set—a 58.22-meter (191-foot, 0.0-inch) effort—was the second-longest hammer throw in the country, and his record still stands. He also holds the Augsburg record for the 35-pound weight throw, 16.48 meters (54 feet, 1.0 inches). 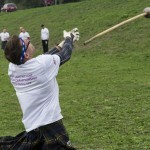 In 2007, as he viewed highland games on ESPN, Dahlin decided they looked like a lot of fun. He decided to compete. 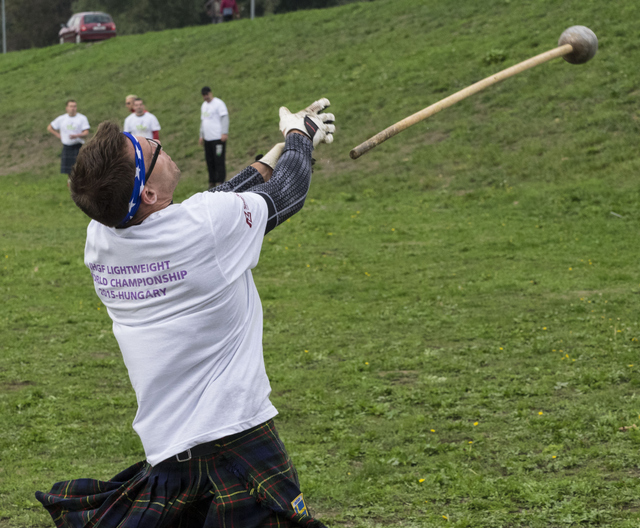 Scottish and Celtic in origin, highland games include heavy athletics (stone put, caber toss, weight throw, hammer throw, sheaf toss, weight over bar, etc. ), as well as dancing, drumming, piping, and other types of Scottish entertainment. Weight over bar is Dahlin’s favorite, and he says the feeling of throwing a large weight more than ten feet above his height and watching it sail over a bar is “absolutely incredible.” At recent games in Arizona, hundreds of spectators stood within feet of him as he prepared to toss the weight, and he could feel the reverberations of their screams and cheers in the soles of his feet. He is convinced that helped him get the winning toss that day. In 2012, as Dahlin continued with highland competitions, he became more concerned about the wear and tear on his body and determined to lose weight. Within a year he went from 281 pounds to 197—qualifying him to compete in the newly established lightweight class. The new weight loss was easier on his frame, but it meant that he needed to re-learn all nine events, learning to throw with speed instead of strength. He also discovered that most of his competitors in the lightweight category weighed about the same as he did, whereas in his earlier contests, there could be as much as 100 pounds’ difference between competitors. 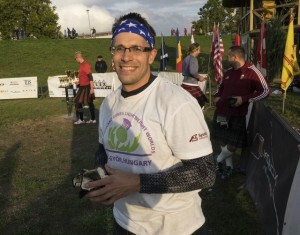 Having competed in Iceland, California, Florida, Texas, and countless other states, Dahlin traveled in 2015 to Gyor, Hungary, to compete as part of Team USA in the 2015 World Highland Games Championship, where he squared off against 15 other athletes from around the world. 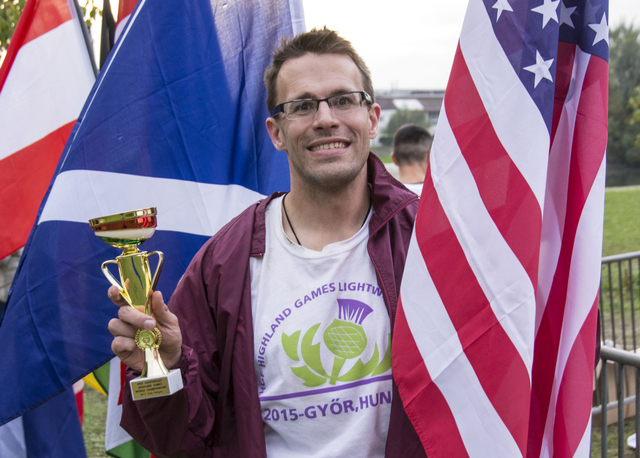 He was pleased to put in one of his best performances ever in caber (tossing a 175-pound wooden beam), and managed to get 7th place. Being in Gyor was an incredible experience, says Dahlin, and even though language was a bit of a barrier, event organizers assisted the athletes to learn some of the local language and showed them the area. Rich in history, the area included a monastery that was nearly 1000 years old, and all the buildings and hills each seemed to have a story. The competition venue was on the riverfront and was filmed for European TV. When Dahlin reflects on his Augsburg experience, he is especially thankful for coaches like Jack Osberg (football) and Dennis Barker (track and field), who took a chance on him, even though he was not highly recruited out of high school. He learned how to work hard, improve himself, become accountable, and pick himself up after defeat. He believes Augsburg gave him a chance to build leadership skills, and to learn that it is okay to fail.